The Attendance report aids the Hubstaff scheduling feature for better schedule management. 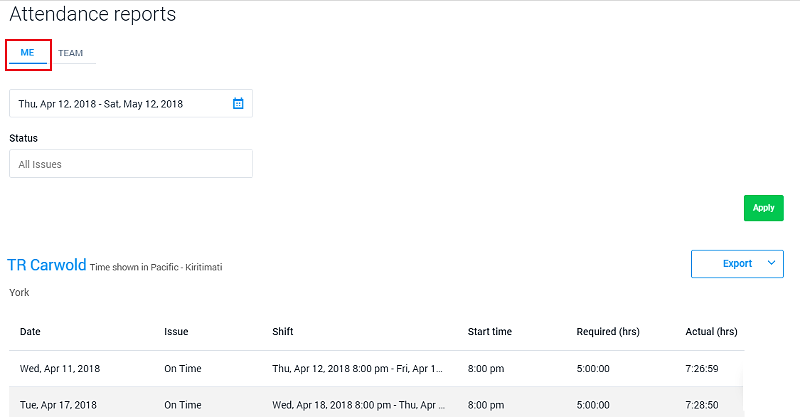 It shows your Team members’ completed, late, abandoned, and missed shifts on the Team tab. You also have the ability to view your own schedule details by clicking on the Me tab. Only Owner and Manager roles will have a Team tab. To access the Attendance reports, click on the Reports tab and then click on View all reports. For organization owners/ managers choose the Team tab to check your team details. For individual users (user role) it will default to Me tab. On the Team tab, you will have 4 filters. You can group the reports by date and member. You can customize the report by specific dates, members, and by shift status. Both reports have 6 columns: Date, issue, shift, start time, required hours and actual hours. On the Me tab you will have 2 filters. You can customize the report by specific dates or by shift status. Reports can be exported to PDF and CSV formats. Simply click on the Export button and choose the format that you prefer.